augustusbrown | rails and tales. Could you find your way if you were given a piece of paper with a line on it and a little north symbol? Public Transport Victoria and Yarra Trams think you can. This is a cropped section of the south east. Tell me, using the new map, at what two streets do the route 6 and the route 78 intersect? Tell me, what two tram routes run on Dandenong Road? The old map can tell you that. Tell me, what’s the name of the big trunk that most of the tram routes in this section branch off? You probably take my point, the map is about as map-like as spaghetti on the floor, but why? Was the graphic designer given free rein, allowed to make a work of art rather than something that’s actually useful to the public? I made contact with Yarra Trams to tell them that their new map is useless and received a reply of the same. “Thank you for contacting Yarra Trams regarding the new network map. Yarra Trams appreciates the time you have taken to provide us with your feedback. The new map is part of a suite of new information that will be released in the lead up to the network and timetable changes on 1 May 2017. For further updates please visit www.ptv.vic.gov.au. Looks like I’m going to have to travel the trams with a fine-point black marker from the 1st of May. Anyone want to come with me? Postscript: The new map has been altered today to include some extra street names in the route descriptions, but not on the map itself. A little project I have decided to undertake is to map Melbourne’s connected bicycle network. It will take a very long time to map out to the suburbs, but from the little I have mapped so far it is already possible to see gaps in the bicycle network. The colour coding is not rock solid. Toggle satellite view to see street names. See the map here or below and pop back every now and then as I keep mapping. A major gap already visible is Spencer Street on the western edge of Melbourne’s CBD. Another is Southbank and South Melbourne as well as Lorimer Street in Fishermans Bend. 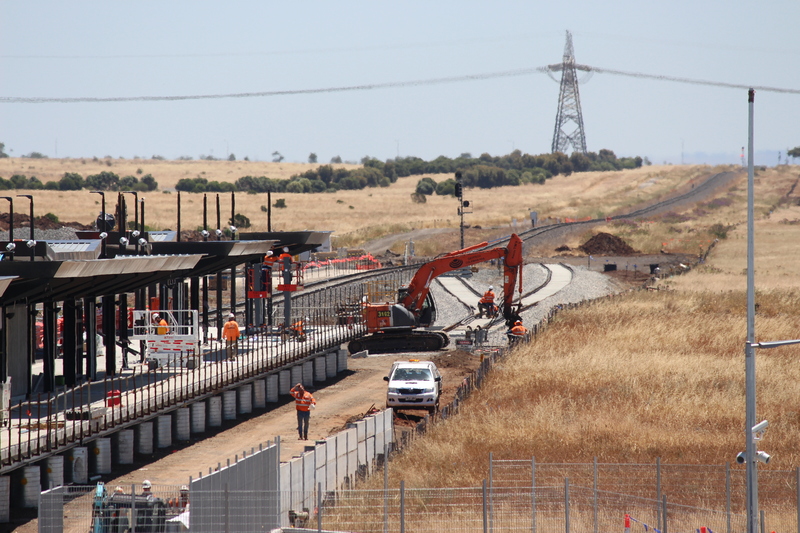 I popped over to Caroline Springs Station on the Ballarat line to see the how the project was going before its opening on the 29th of January next year. The station has been a long time coming and has been faced with more than its fair share of issues all of which has resulted one great big mess. Construction of half the station was completed months ago. The original design, which is the design showcased on the PTV website, was a single platform on a single line section of track. 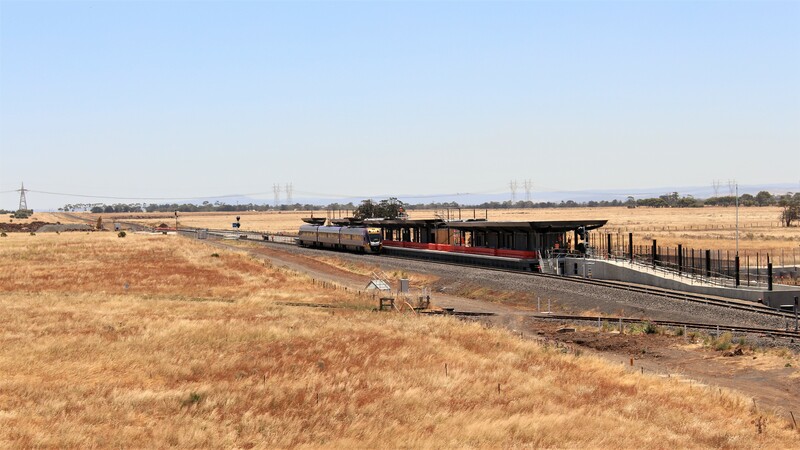 It was never going to work and when the Regional Rail Link opened and forced the Ballarat line to operate at or beyond capacity, someone at V/Line probably had a little spasm in the Minister’s office and secured costs for duplication of the line to Melton. With that the station was expanded. The platform that had already been built was widened to become an island platform and the track on the new side is under construction. The station will have a set of points at both ends as seen above and below. Hopefully this will allow trains to turn back in both directions during disruptions. 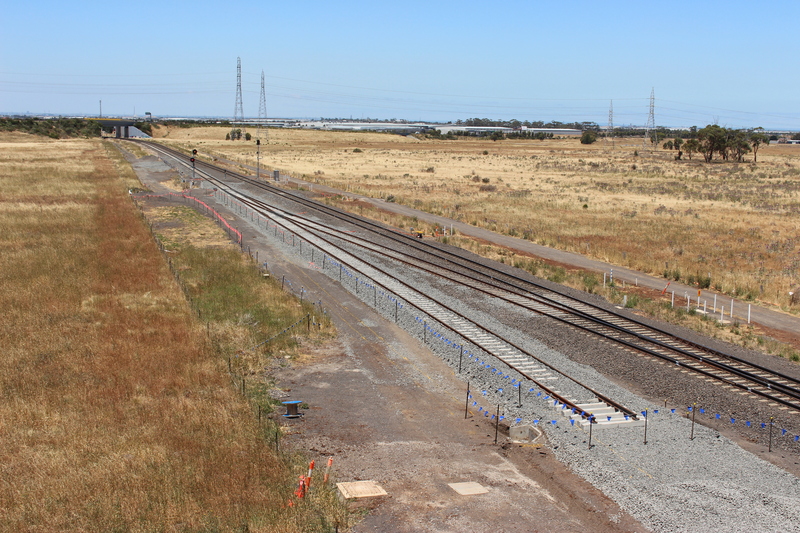 The new station will be a very easy place to run train replacement coaches to and from with it being next to the Western Freeway. 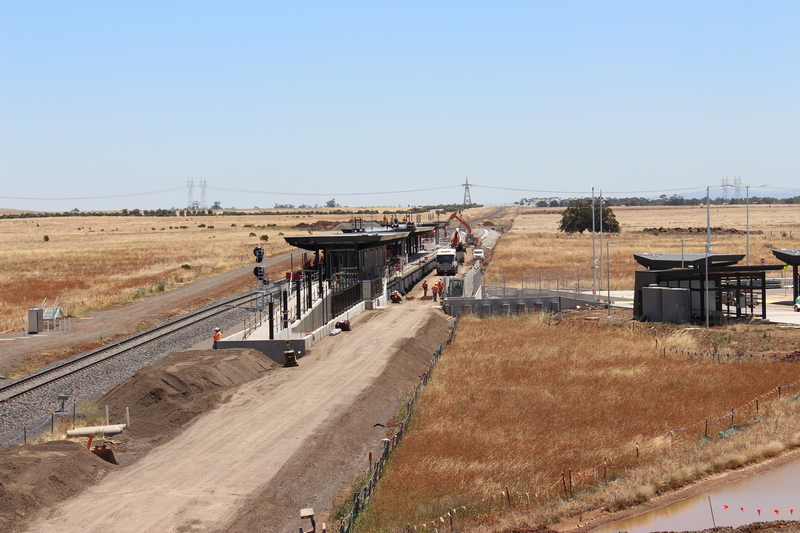 The station is in a paddock out of town so you can expect most users to come either by private car or bus. 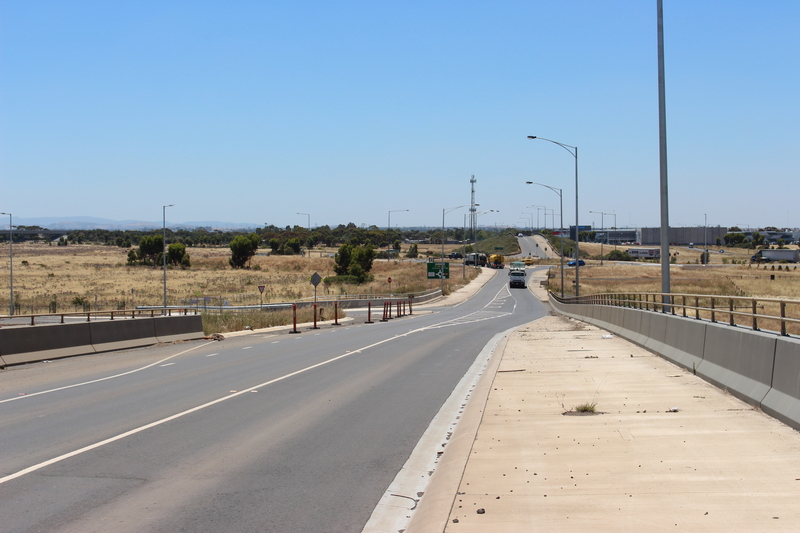 An issue that was evident well before actual construction of the station was announced was the roundabout at Christies Road and the Western Freeway off ramp. During the evening peak the off ramp is jam packed with motorists coming home from Melbourne. 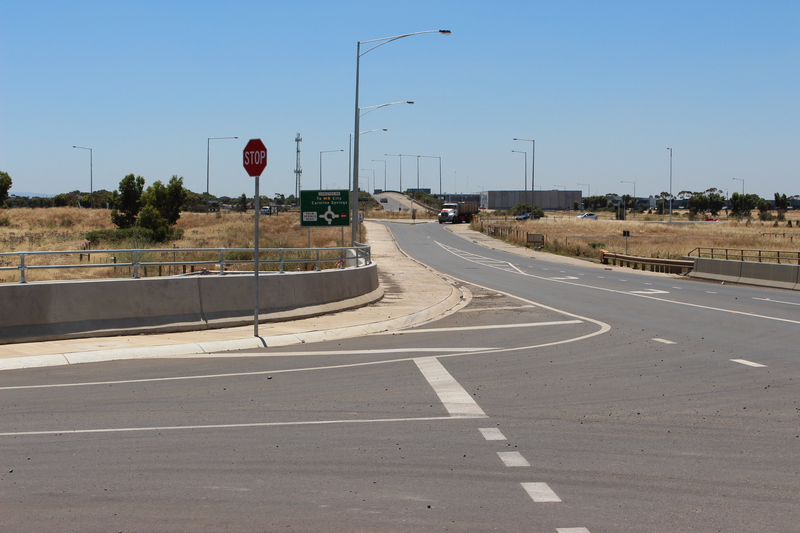 They sit through the roundabout and prevent any road user from the south (from the new station) from entering. 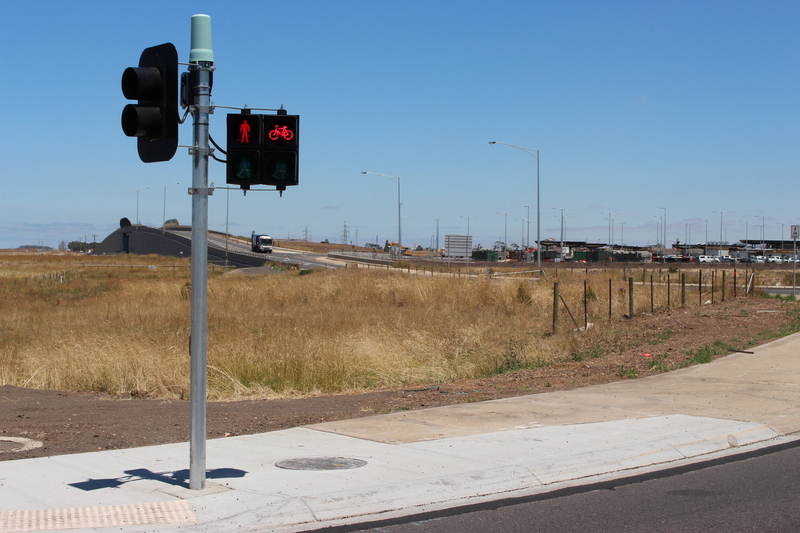 But it seems this issue may have been addressed with the addition of a signalised pedestrian crossing at the end of the off ramp with the inclusion of a vehicle sensor on Christies Road. 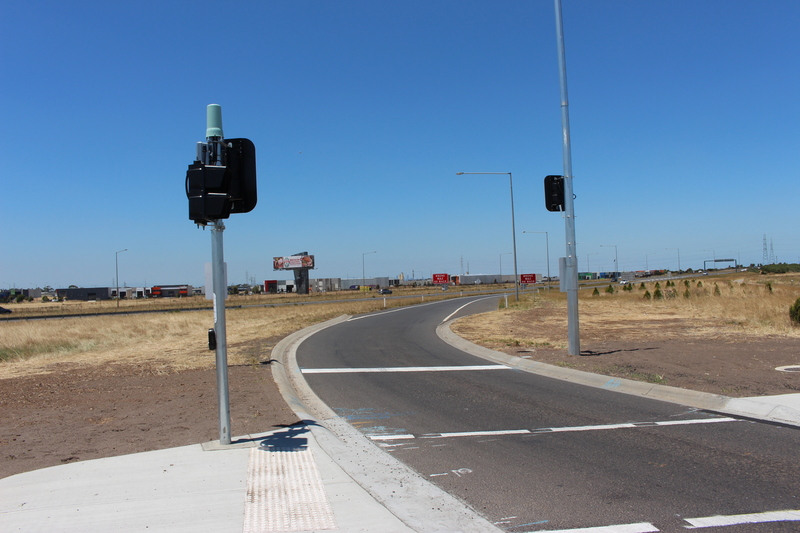 I assume the sensor would activate the pedestrian crossing after a time to stop off ramp traffic and allow station traffic to enter the roundabout. This could almost be a footnote, coming to this station on foot or by bike would be quite intimidating. First, it is about four kilometres from the town centre to the station. 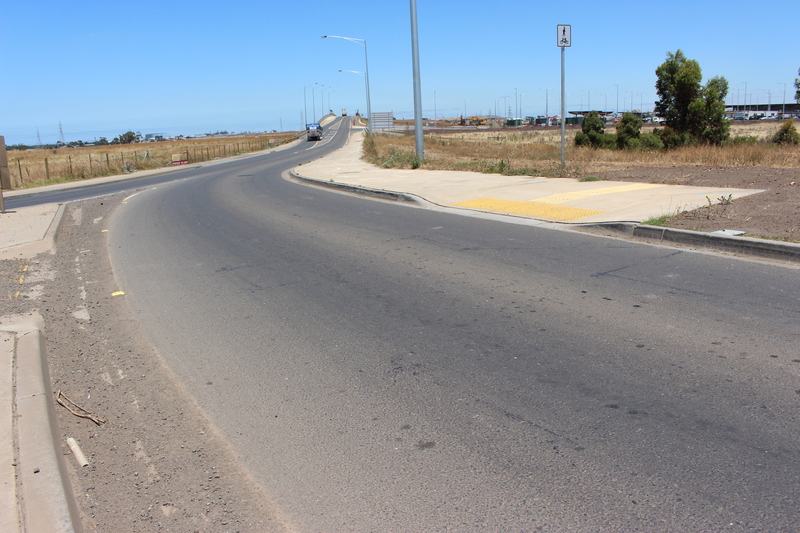 Second, the shared path is terrible. 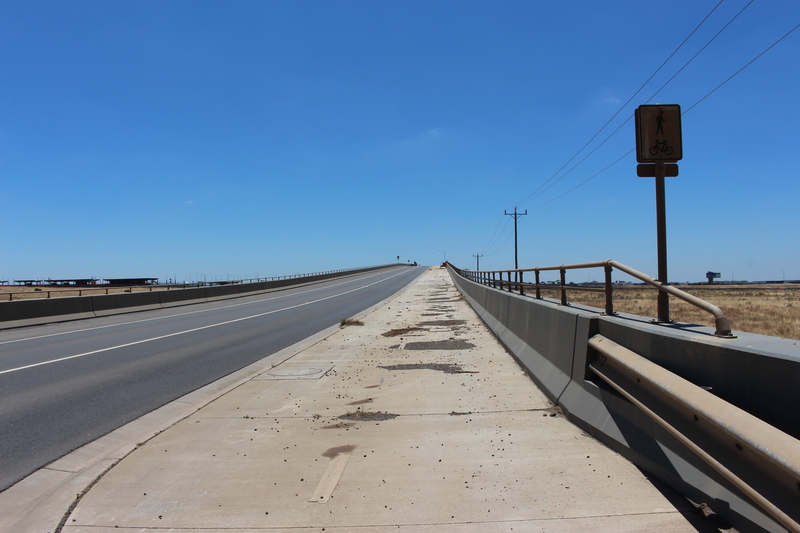 It is dirty and very close to the road and the hurrying motorists and the truck after truck after truck going to and coming from the Boral Quarry would put off even the most determined walker or cyclist. There is also a shared path heading south from the station to no where, but it had to be cut into to make room for the turning lane. The road was built for the station. Wonderful planning. But there is no need to worry, I was probably the only path user this month. This post continues this earlier post. It is with great regret that I abandon the Linux ship. I have returned to Windows following a week or so of piling issues faced by my ThinkPad E460, from the graphics processor to the SD card slot and the power management. While I did manage to get everything working, aside from ideal power management, at no point did everything work at the same time. I am not the type of person who can live with a problem that is not currently causing an issue, everything must be ready to work straight away and I think it was that, ultimately, that sent me back to Windows. The disappointing thing is that I am fairly sure that Mint 18, the latest release based on Ubuntu 16.04, would offer much greater support for my hardware, but its lack of support for AMD has turned me away. It needs to be said that Windows 10 is far from ideal, also. While everything works at the same time, and my current expected battery life is eight hours, it is a resource hog and horribly controlling. The memory usage right now is two and a half gigabytes while the same usage on Linux Mint 17.3 Xfce would be much less, somewhere around 500 megabytes. I have ‘uninstalled’ Get Office and Get Skype three times now, but they keep coming back. There is no way to disable Cortana in the latest update, 21 programmes were allowed to run in the background by default and there are so many privacy settings, it would be great to have one option to switch everything off. In a few years, if support for AMD has been developed, I will return this laptop to Linux. And, despite my opening sentence, I will continue to experiment with Linux on my desktop computer. I have been running Linux Mint 17.3 Xfce on my old Dell Latitude D830 for more than a year. The laptop would have been useless without Linux, which is free in most cases, as Windows XP is no longer supported, but it got to a point where the performance of the laptop became too much of a drag and it is now barely capable of anything more than the worst Chromebooks. Installing and using Mint from last year has been my first real experience with Linux. 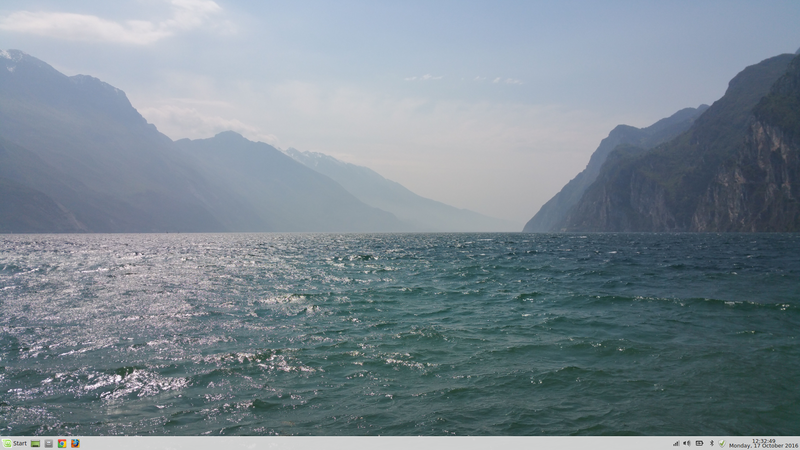 The Xfce desktop environment is lightweight, easy to customise and Mint comes with so much software out of the box that it is really just a grab-and-go experience. It became my default operating system since it was more comfortable to sit on the couch with a laptop than sit at my desk with my desktop PC. I was so impressed by it that I offered to revive old school laptops sitting in the cupboards of family and friends and I put a terrible old tower under the television, which is only ever turned on to show the whole family the weather forecast. So when I decided to buy a new laptop I had no hesitation in throwing away Windows 10, for which there are great privacy concerns and ever decreasing control of your own device, and installing the latest Linux Mint release. The laptop I bought was the Lenovo ThinkPad E460 on special for $999 AUD. It came with an Intel Core i7 6500U processor, eight gigabytes of RAM, a 256-gigabyte SATA three SSD and an AMD Radeon R7 M360 two-gigabyte graphics processor that runs alongside Intel integrated graphics. Those in the know may have just spotted a problem. The latest Linux Mint release, Linux Mint 18, does not support many AMD graphics processors anymore, or more accurately, Ubuntu 16.04, on which Mint 18 is based, no longer supports AMD. I knew this was the case before I bought a new laptop, but somehow I had come to think that it was only old AMD graphics processors that were no longer supported, something you might find in a desktop from 2007. I started by installing Linux Mint 18 Xfce. The first problem I encountered was Secure Boot, which is a feature of UEFI (a different sort of BIOS or something). Secure Boot needs to be disabled for many Linux operating systems. Mint had me enter a password that I would need to repeat to disable Secure Boot, but when it came to repeating it the interface was completely alien, it seemed to be asking for the sixth, then the 10th then the eighth character of the password which I did not understand until it was too late and the whole thing failed. Not to worry, I entered the UEFI(? ), let us just call it the BIOS, and disabled Secure Boot the easy way. I installed Mint 18 again. After login I connected to WiFi and installed available updates. I then went to the Driver Manager which did not show my AMD graphics processor. My stomach sank and then the laptop froze. I did a ‘soft off’ (held the power button down for four seconds) and logged back in, but it froze again almost instantly. And again, and again. I installed Mint 18 a third time, but first I let the ‘medium’ check for errors which was an option from the boot screen. There were no errors, but the computer froze again and again until I gave in and downloaded Mint 17.3 Cinnamon. AMD is supported in 17.3, which is based on Ubuntu 14.04. The install went perfectly, but after login I noticed that I had no WiFi option nor were than any WiFi drivers in the Driver Manager (but AMD was there phew). I did some Googling, via Ethernet, and found I was not the only person with the issue. It appears that the WiFi card in modern computers is not supported by the Linux kernel in Ubuntu 14.04. It was at this point that I seriously considered going back to Windows 10, but happily I found this step-by-step procedure by Gary Newell that ‘backported’ the newer Linux kernel, or at least enough of it to fix the problem. The fix had to be undertaken in the Terminal (Command Prompt), of which I am a complete novice, but since it was just a copy and paste procedure, it was quite easy. Thank-you, Gary. Why I decided to install the Cinnamon desktop instead of Xfce I have no idea, but I nearly instantly regretted my decision. The ThinkPad I bought has a full HD 1080 by 1920 display, which is beautiful, but everything is very small and the Cinnamon desktop included in 17.3 doesn’t have an option to increase the number of dots per inch (DPI). The Windows 10 DPI was somewhere between 125 and 150, anything less and you need a magnifying glass to see everything. So, fifth time lucky, I went back and got Linux Mint 17.3 Xfce that has an option to alter the font DPI and permits many more customisations that Cinnamon appears not to. And I repeated the WiFi fix. Looking back, I was an idiot not to do a simple Google search for, “AMD R7 M360 Ubuntu 16.04,” I would have known straight away that it was not supported and I probably would not have bought the laptop. Of course I cannot know for sure that it was the unsupported graphics causing the laptop to freeze, but even so, I would not have wanted a useless graphics processor. To add salt to the wound, three or four days after I ordered the E460, Lenovo released the E470 which has Nvidia graphics! But looking forward, 17.3 is supported until 2019 by which time there might be an AMD solution or I will just have to go back to Windows. I suspect there may be a power management issue at the moment anyway which may send me back to Windows to make use of Lenovo’s support, but I will monitor that for the time being. 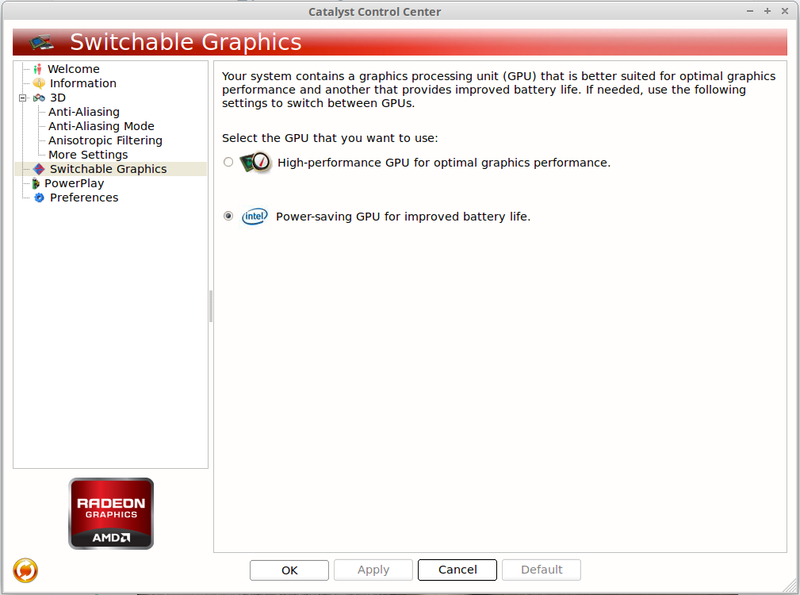 I found this setting in the AMD Catalyst Control Centre that may improve my battery performance. I will just have to remember to switch back before video editing.